Keystone Camera Electric Eye Movie Camera Ad 1959 This is a May 4, 1959 advertisement It is a nice color ad from Keystone Camera Co Inc of Boston. Ad shows a lady operating the Keystone Camera and it reads, ""New! Keystone fully automatic electric eye movie camera. Complete with turret and 3 lenses."" In excellent condition. Photo is taken through plastic and may show wrinkles or crookedness that is not in the ad. This magazine tear sheet measures 5 3/4"" wide by 14"" tall. 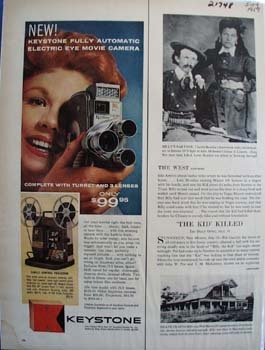 Items Similar To "Keystone Camera Electric Eye Movie Camera Ad 1959"